From there it was back to my room to savour the win, start working on updates to the website and of course, start figuring out how the heck I was going to get to Green Bay before 4pm Tuesday for the ‘Return to Titletown Parade’ without breaking the bank… any further than it had already been broken. With all good intentions of being as productive as that sounds I managed a call to my lovely wife and then fell asleep, shoes, jeans, jacket and all, right there where I laid. Needless to say I woke up horribly uncomfortable and steaming hot though I did manage to sleep through until almost 10. Good in that I needed the rest. Bad in that I didn’t actually accomplish anything. No website updates, no flights or transport booked for Green Bay and more importantly, no packing up of my stuff to vacate the room as required - after all, I couldn’t stay in Dallas forever could I! As it turned out, check-out time was 11am so I was quite literally buggered! I did manage however to sweet talk my new friend at reception into allowing me a check-out time of 1pm so i was relieved to say the least. That allowed me enough time to shower (believe me, I needed it) arrange my transport to Green Bay, pack my things to head down and stay with the Brunners for my last night and get my hire car ready for return. I must say, after a very lazy morning I managed to get a whole lot done in a very short period of time. Whilst my friends took off to see some of the sights of Dallas and do a tour of the stadium, I stayed back to get my Super Bowl updates done. And watch some more highlights of the game as they came on the tele. Fact was, though I’d have loved to drive around and check things out I was so keen on getting to Green Bay that I had to do as much as possible as quickly as possible ‘cause I knew my next two days were going to be nothing short of hectic. After accomplishing some of what I needed to do the boys were back and we had Mexican for dinner. One final dinner before it was time to say good bye to some of my favourite Packer backers for at least another year. And with that my time in Dallas was as good as done. I arrived in shorts and flip-flops, without a ticket to the game, unaware of whereabouts in town I was actually staying and with no transport or cell-phone connection to speak of. 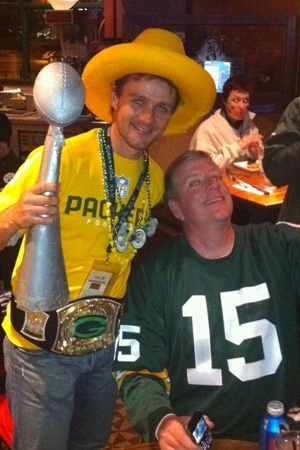 Within 4 days I had found myself a phone, hired myself a car, succefully navigated my way on the wrong side of the road I might add, between Farmers Branch, Dallas, Arlington and Fort Worth, located myself a ticket to the Super Bowl and watched, live, as the Packers won their record 13th World Championship. Sometimes we don’t know what’s possible until we get out there and give it a go. This week I gave ‘going to the Super Bowl’ a go and I managed to turn it into one of the greatest experiences of my life. The only thing between me being in Dallas and being on my way to Green Bay at this point was a 3am wake-up call. No comments have been posted about this entry just yet.